What do you do if you come to London to photograph an event that finishes around 11am and then want to photograph another that doesn’t start until 3pm? On International Worker’s Memorial Day (April 28th) I decided to go for a walk in the park. 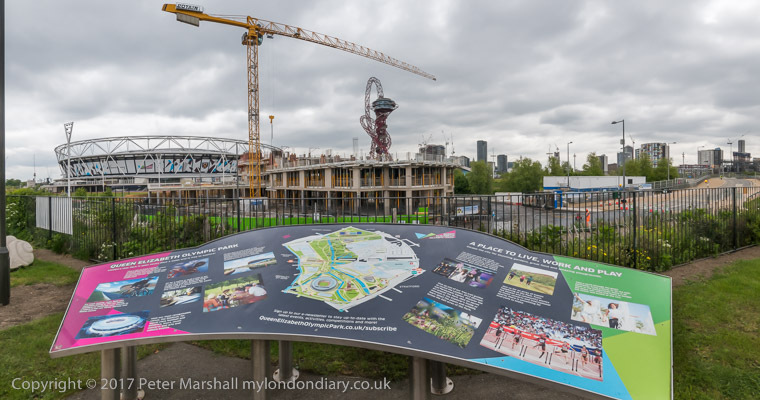 The former Olympic Park, now called the QEII Park. 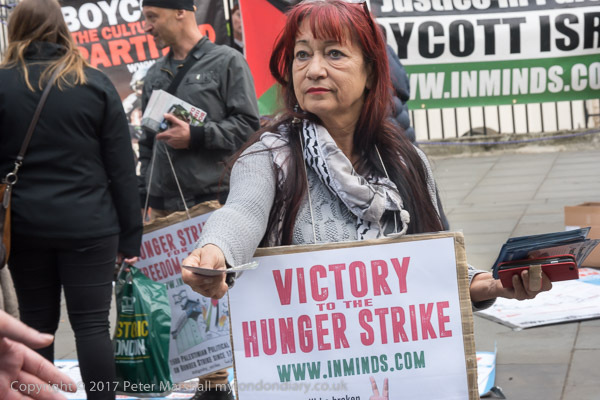 The International Worker’s Memorial Day commemoration in London is one I try to go to every year, though I don’t think it’s a particularly good event to photograph, either financially or artistically. Safety at work is an important issue, and I used at one time to be a safety officer at my workplace. 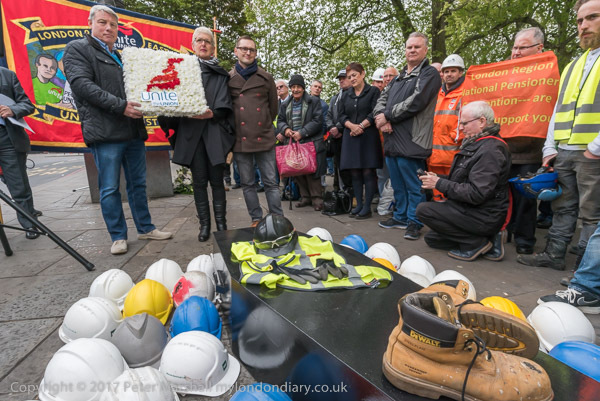 People often joke about health and safety, but we have seen legislation that has made all workplaces safer, though some right-wing politicians want to sweep it away as ‘red tape’, and this and the previous government have sadly greatly weakened the enforcement of regulations. Of course sometimes regulations get misinterpreted and used as a pretext for things that clearly were not intended, but much more often they are flouted because companies know they can get away with it. 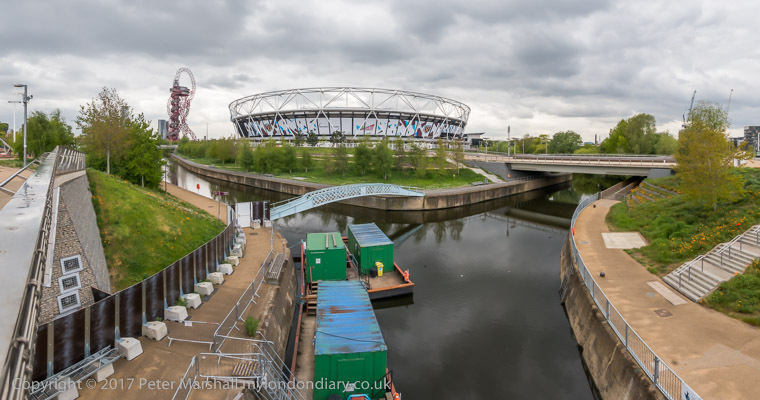 It wasn’t my first visit to the park – I’d gone shortly after it was reopened to the public, and made another short visit more recently on my way to a protest in Stratford, and the weather wasn’t ideal for making the kind of wide panoramic images I intended. With such a wide expanse of sky in many of the pictures its often useful to have some interesting clouds in a blue sky; sunlight tends to brighten the mood as well as increase the light levels, but it’s best to have plenty of cloud both to get rid of huge expanses of empty blue sky and also to reduce the local contrast with shadow areas being illuminated from the clouds. It wasn’t too bad. Although there wasn’t – until I was getting ready to leave – even the smallest patch of blue sky for those sailor’s trousers at least the clouds had some definition – and there was not the problem of avoiding getting the sun in picture, which can be tricky on sunny days with a roughly 145 degree angle of view. And though we mainly see blue skies as a nice even blue, film or sensor is very sensitive to the increase in illumination. 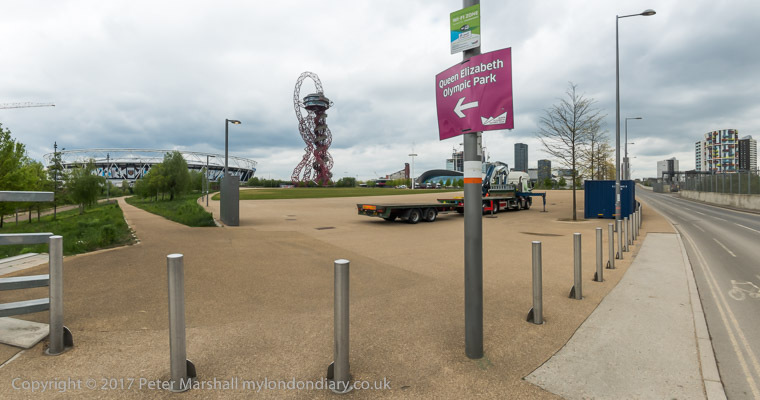 I’d hoped that almost 5 years after the Olympics the park might have matured, and was rather disappointed. It doesn’t really look like it will become much of a park in my lifetime, if ever. And while it was good to find that they are still intending to replace Carpenters Lock, it does seem to be taking rather a long time. It was my first visit to the northern extremes of the site, and I also made use of the new foot bridge across the Lea Navigation to make my way to Hackney Wick station to catch a train back to Stratford and then the tube into central London to photograph a vigil in solidarity with the over 1500 Palestinian prisoners in Israeli jails taking part in a hunger strike. This entry was posted on Thursday, November 16th, 2017 at 05:40 pm and is filed under My Own Work. You can follow any responses to this entry through the RSS 2.0 feed. You can leave a response, or trackback from your own site.